At first glance, it appears that Braven might be more than what it turns out to be. The opening credits feature a montage of shots of the wilds of Newfoundland – images so stunningly beautiful that they would be at home in a nature documentary. However, the hope that these visuals might be setting the stage for something unconventional and atmospheric is quickly dashed. 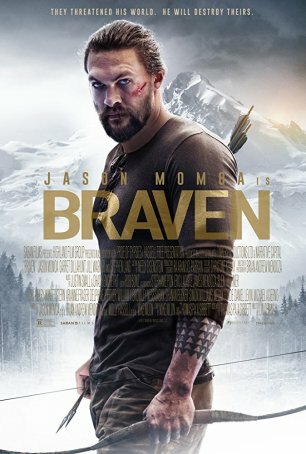 Putting aside cinematographer Brian Andrew Mendoza’s contributions, Braven is a standard-order action/thriller with adequate performances, occasional bursts of tension, awful dialogue, and a minimal narrative. Aside from being a showcase for up-and-coming action star Jason Momoa, it offers little else of note. Momoa’s days of appearing in low-profile material like Braven (which he filmed in late 2015 and early 2016) are at an end. His resume now includes Game of Thrones, a Conan reboot, and appearances as the iconic DC superhero Aquaman. He’s a hot property in the action domain so it’s no surprise that Saban Films acquired the distribution rights to what otherwise would have been a forgotten film. Now, Braven might not be forgotten but that doesn’t prevent it from being forgettable. Wasted opportunities abound. What could have been a tense siege film turns into something considerably less suspenseful. Early in the proceedings, we’re warned that a storm is coming in. We’re treated to shots of the lonely isolation of the surroundings. Those are red herrings. The movie devolves into a shoot-out followed by a lot of running around in the woods. The main bad guy, Kassen (Garret Dillahunt), isn’t especially intimidating. Throw in a child in danger subplot and the film seems more interested in checking off boxes in the “generic action/thriller category” than developing something visceral and energetic. The movie opens with a torturously long first act that sets everything up. Joe Braven (Momoa) is taking his dad, Linden (Stephen Lang), to an isolated cabin for some bonding and truth-telling. It seems that Linden’s mental acuity is in a downward spiral and something is going to have to be done. Joe doesn’t want to put Linden in a home but some sort of supervision will be needed. The old man can’t be left alone with his granddaughter, Charlotte (Sasha Rossof), whom he occasionally doesn’t recognize. Unfortunately for Joe and Linden (and a stowaway Charlotte), a group of drug smugglers have used the cabin’s shed as a hiding place for their goods. Heavily armed and ready to shoot, they arrive to retrieve the merchandise. A standoff develops and, with no cell service and only a single gun, Joe devises a risky plan that offers a chance of survival despite the dismal odds. There’s an obvious temptation to compare Momoa to Arnold Schwarzenegger. Both have bulging biceps and heve played fantasy-dom’s best-known barbarian. Momoa, however, is a more nuanced actor, although he’s not given much of a chance to show it in Braven. The “serious” aspect of the movie, a father and son coming to grips with the former’s dementia, is fumbled from the outset and clumsily resolved. As far as the action scenes are concerned, Joe is surprisingly weak in a fight. He gets in his shots, but he’s constantly being pummeled. His “final solution” (which is clever) requires him to undergo a painful injury. Braven has a few suspenseful sequences but none are able to sustain the momentum. Charlotte’s presence, instead of amping up the tension, has the opposite effect. She becomes an unwelcome annoyance – an intruder on what should be a pure excursion into the Land of Testosterone and Adrenaline. The “child in danger” scenario is always manipulative but in a movie like this, where all we want is to see the heroes overcome the odds and take out the bad guys, throwing a young girl into the mix creates an awkward and unpleasant dynamic. Put Joe and his father in a fortified cabin with a storm raging outside as the bad guys close in – that’s a movie with a great hook, but it’s not what stuntman-turned-director Lin Oeding (making his feature debut) and his writers have given us. Instead, we get what feels like a lost Steven Seagal screenplay that someone found and unwisely decided to produce.